Tim McClinton played football and baseball in high school, but he knew by April 1989 he didn't want to play football in college. He just had to decide whether he wanted to play baseball in college or skip that to play in the pros, according to The Chicago Sun-Times. "I've always wanted to play professional baseball," McClinton told The Sun-Times. "So I'll have to make a decision if I'm drafted." McClinton was drafted that June and he decided to turn pro. His career lasted five seasons. He never made AA. McClinton's career began as a fourth-round draft pick of the Mets out of Downers Grove North High School in Illinois. At Downers Grove North, McClinton served as the kicker in an October 1988 game, but missed a late field goal. He started with the Mets at rookie Kingsport. He hit .278 in 70 games. He also hit eight home runs and stole 16 bases. He hit one of his home runs early in a July game. McClinton moved to single-A Columbia and short-season Pittsfield in 1990. He hit .255 between them, with two home runs and 25 stolen bases. He went 0 for 4 with a stolen base for Pittsfield in August at Welland. He played 1991 completely at Columbia. He hit .249, with a career-high 14 home runs. He hit his 12th home run in a July game. 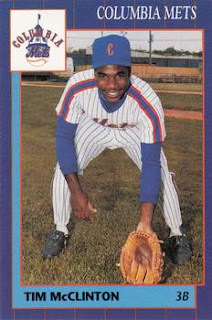 McClinton then played 1992 between Columbia and high-A St. Lucie, then 49 final games at St. Lucie in 1993 to end his career.